New music (as in New Music) used to make me want to run and hide. From my own inability to make any sense of it. Without some kind of reference to melody I’m unanchored in a sea of sound that only seems to work for listeners who understand the history of music-making and a lot of music theory. 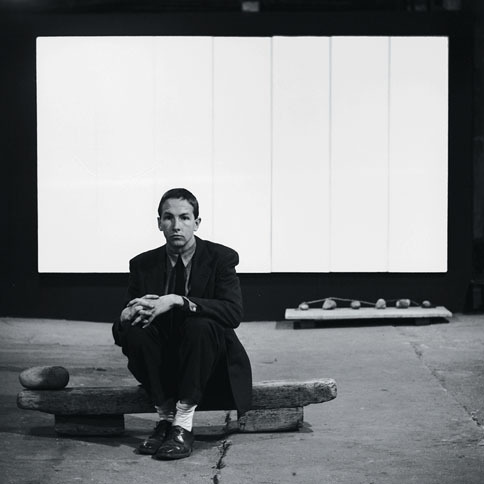 So even though I get why it’s called music in the same way that I get why Robert Rauschenberg’s White Painting is art—I don’t need to listen to it on the radio or hang it on my wall. The very fact that I still think Modern Art and New Music are modern and new dates me for sure because they’ve long been part of academic creativity at least and I have a number of friends whose lives have shaped or been shaped by them. However, for the first time ever I got a glimpse of what is going on in 20th century classical music anyway when I attended the Kyoto Prize Pierre Boulez concert yesterday. (Caveat- it was Pierre-less due to volcanic ash so the most excellent Stephen Schick stepped in to conduct.) I went because Sur Incises is written for 3 harps and 3 pianos plus percussion including a marimba. Ellie Choate, Susan Allen and Phala Tracy were playing the harp parts and I was ready to be dazzled. Absolutely. Evidently Boulez has used Sur Incises as a teaching tool in the past because there’s a 3 video sequence on you tube (the first one embedded here) that the presentation I just sat through—enrapt—was based on. He builds the music phrase by phrase and instrument by instrument with explanations for each change so that by the end you understand the composition. As Boulez was grounded in France, Philippe Manoury stepped in to narrate and did a great job presenting what the composer would have said if he were there. So by watching the harpists I could both see and hear what was going on in the music in a whole new way. Such a privilege. Very uplifting and I’m grateful for the opportunity to creep closer to understanding at my own pace. My own pace being more in tune with the clip below which I understand completely. So in many ways I’m as grateful to the maestro who posted Windows XP error music on one of the harp sites (thank you SV) as I am to Boulez, Manoury and the three world-class harpists who were willing to share their reality on my terms. Great blog – did you stop playing or just stop blogging? A great aunt of mine played harp with the Hallé Orchestra and I’ve always found the sound of the harp enchanting, particularly in Celtic music. Ambitious project – hope you’ve continued….